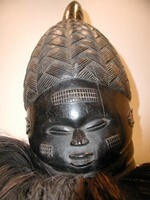 These association masks come from the Poro and Soweii societies. The masks are integral to ceremonial rites of passage, in which young men and women are indoctrinated into the social responsibilities of adulthood. The exhibit is being developed by art history students in the Department of Visual and Performing Arts, under the supervision of Dr. David Parrish.